When frustrated with writing, sometimes mixing up the scenery and searching for inspiration in nature can give you the final push to continue making progress. After writing the UNC abstracts, the next task was to put together the manuscript for the service learning journal. This has proven to be a challenge because I wasn’t a part of any of the data collection and I was putting together the methods and findings from a variety of other studies performed by high school students on biosand filters. Once I understood everything that had been done and put the pieces together for an introduction, methods and materials, and results, the next challenge was to find the service learning, educational story behind it. 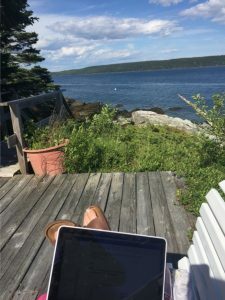 While some writers are able to see the big picture right away and create an outline from that, I am one of those writers that needs to start writing and get all of the details down before taking a step back to see the story behind a work of writing. To compare this writing process to a forest, one must see the forest for what it is and not get too hung up on each individual tree. Soon after, I turned the manuscript over to one of my internship mentors, Dr. Barbara Stewart because I am learning how important collaboration is in scientific writing. During the week of June 26, I helped manage students at the SMART Stormwater Institute. The Stormwater Institute is a program funded by the National Science Foundation at the University of Maine that brings in minority groups (mostly women and underrepresented minorities) to teach them about Stormwater through a STEM lens. Students were from 9 different states, including California, Florida, Idaho, and Maine. On Monday, students tested water at two local rivers: the Penobscot and the Stillwater. Sensors, that were built before sampling, measured conductivity, pH, temperature, and DO through an AirLink that connected to an app on the students’ phone via Bluetooth. My job on the first day was to help the students process samples for total coliform and E.coli bacteria and to wrap one of their samples in tinfoil (to prevent light from getting to it for calculating dissolved oxygen) and to incubate them for 24 hours at room temperature. Microbial samples were processed using the IDEXX Colilert Media and Quanti-Tray/2000 methodologies by storing them for 24 hours in a 35 ˚C incubator. The highlight of my very long day, which started with opening speeches by people in the field of water/engineering/STEM at 8 am and ended at 9 pm when we put the last samples into the incubator, was when I got to wade around in the Penobscot going to all five water testing sites to get water samples to do dilutions. I ran some 10 mL dilutions because testing on the local Kenduskeag stream from the BSF lab study a couple of weeks ago indicated levels of total coliforms higher than the IDEXX Most Probable Number Scale would measure (>2419.6 MPN/100 mL). Tuesday was another long day for students, but I worked on the service learning manuscript in the morning and then worked in the microbiology labs at the University of Maine in the afternoon with Barbara Stewart, Cathy Hopper, and Jon Musor, all members of our Honduras travel team. I had my own laboratory classroom of 18 students and a few of their teachers and my goal was to teach them how to read their samples using quantification methods based on the Most Probable Number (MPN). E.coli was a fun topic to teach the students how to quantify because they had to put the samples under a UV light and count how many of the sample wells were fluorescing a pretty blue color. When I asked the students what they thought of when they heard the phrase, “E.coli”, one student responded with “Chipotle!” I continued to explain that while we do have E.coli in our gut, when consumed through water it can cause diarrheal diseases. This is why the World Health Organization has safe drinking water guidelines based on E.coli levels. It was an amazing opportunity to get to interact with such a variety of science people from all over the country. 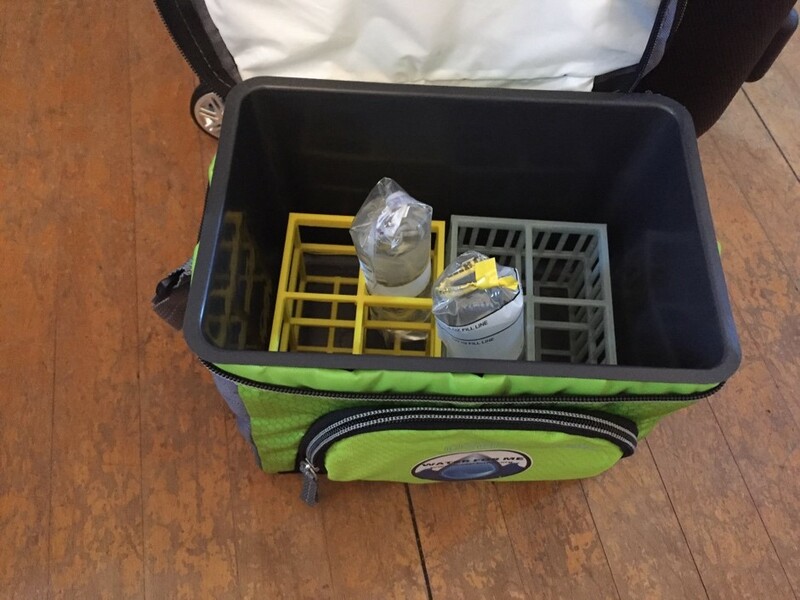 In previous travels, we discovered that WhirlPak bags, used for sample collection, did not fit well in the small coolers used in-country. A clever engineering student came up with the design for miniature WhirlPak holders that fit in the small coolers. My mentor, Dr. Barbara Stewart, at Bangor High School 3D, printed this design to make sampling in Honduras go more smoothly. On July 5th, I drove the 5.5 hours to Rutland, Vermont where the headquarters for Pure Water for the World were located. I met with Carolyn Meub and Jamin Gelder as a mid-summer evaluation on the internship and we covered quite a lot that afternoon. I updated them on what had been accomplished so far and we worked on travel details for the upcoming work to be done in Haiti and Honduras. Jamin connected me via phone calls to two important people in-country for Haiti and Honduras and we were able to smooth out some of the logistics on what we will be doing in their offices while there. I asked about PWW and learned a lot about the beginnings of the non-profit and about both Carolyn and Jamin’s career paths that led them there. These are two incredible women that I am very happy to have gotten to know them this summer. We even briefly discussed potential for an extended project in-country next summer which gives me hope for continued water work in the future. After returning from Vermont, I had one day to get organized for Haiti. We packed four suitcases with laboratory equipment to bring to the PWW office and are now ready for travel. Check back for Cordelia’s update on her Haiti trip! PWW Travelers Haiti, WASH, water analysis, water testing. permalink.